Mark Kernighan extended his lead to 2 points with a win over Bert Shiffman. Greg Tomkovich, Ian Mangion and Pat Mazzillo also notched victories. I was busy setting-up a scholastic event (to be held at the Scotch Plains library) and could not play. Andy Altamirano clinched a tie for 1st by defeating Joe Azzarello. Aleksey Senyatkin won 2 games to move within striking distance of Andy. Antonio Altamirano, who also had 2 wins, is now tied for 3rd. * Indicates intersection games. As per the event rules, Sturniolo's wins will not be counted. The crosstables for week 10 of the KST have been uploaded along with corrected versions for rounds 7, 8 and 9. Mark Kernighan defeated Ted Mann to take a full-point lead. I lost twice by blowing big, simultaneously-obtained advantages against Geoff McAuliffe and Aravind Kumar. Greg Tomkovich remained 3rd despite falling to Max Sherer. Ian Mangion and Pat Mazzillo also won. Andy Altamirano padded his lead with a pair of wins. Antonio Altamirano also won twice. Leticia Sefia collected 1.5/2 from Joe Azzarello. * Indicates intersection games. As per the event rules, Andy's win and Antonio's draw will be counted. Pat's 1/2 point will not. Crosstables, including corrected versions for weeks 7-9, will follow. The 7th round game between the Sefia sisters was a draw, not a win for Leticia. The standings, in round reports for weeks 7-9, have been corrected. Crosstables for those weeks will be adjusted following my 10th round post. Greg Tomkovich's 9th round KST win over Chris Constantino, which the victor posted with light notes on the KCC Minutes blog, has been added to last week's replay page & zip file. 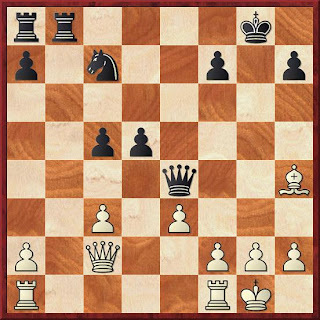 A 17-move win by Dr. K. Edwards, on the Black side of an Exchange French, has cut the Czech Republic's lead over the U.S. to 10-9. Edwards, who also has 2 wins vs. Argentina to his credit, is 4.5/6 (+3-0=3) in our country's ongoing correspondence matches. After a full house in round 8, there was a light turnout last night. Just 5 games were played in the top group and 11 overall. Mark Kernighan defeated late-joining Aravind Kumar and I kept pace by beating Steve Liesch in a tough, strategic game. Both of the winners were worse at one point. Greg Tomkovich and Bert Shiffman also earned victories. Ian Mangion and Mike Goeller drew. Aaron Kiedes, who was unable to attend, withdrew. Andy Altamirano regained sole possession of 1st place with a win over Lou Sturniolo. Aleksey Senyatkin won twice versus Joe Azzarello and is now tied for 2nd. Leiticia Sefia stayed in the prize hunt by taking 2 games, as well. Antonio Altamirano and Pat Mazzillo drew. 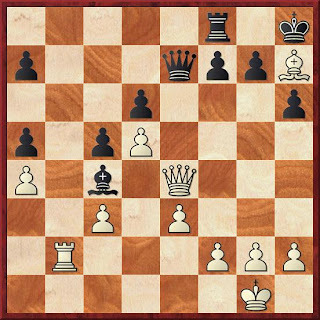 The conditional "if 20...dxe4, then 21.Bg3" has been proposed. Crosstables for round 8 of the Kenilworth Summer Tourney are up.